The weekend began with a spectacular drive across Rannoch Moor with all the snowy peaks lit up by moonlight. The moonlight was also beneficial for helping spot the alarming numbers of deer next to the road that had been brought low down by the cold weather. Despite avoiding the deer, two of the drivers managed to collide with the non moving boulders in the car park, oops! Claire somehow managed to pack both her works Christmas do and driving to Glencoe into one evening. On Saturday, the day dawned bright and clear and everyone departed quickly. Mike & Fiona had a stunning day above an unexpected inversion on Stob Coire a' Chearcaill. 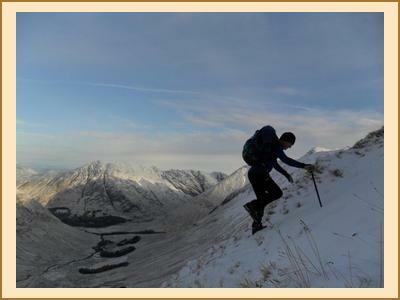 Chris, Alan & Martin did the classic Aonach Eagach traverse in full on wintry condition. Kenny, Alison, Iain, Ali, Rebecca and Carla had a great day on the Ballachulish Horseshoe. Ian, Alan and Claire had good views on the nearby hill Meall Lighiche. 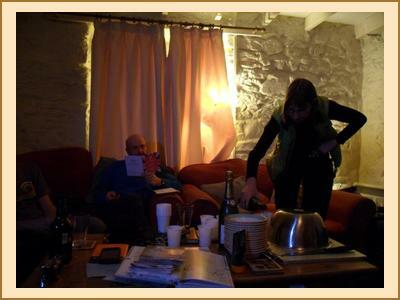 Saturday night involved a wee champagne reception plus a cake to celebrate Kenny's escape from 46 years of employment. Sunday was somewhat of a contrast to saturday with low cloud and rain. Mike, Fiona & Chris went up Garbh Bheinn which was mostly dry and out of the cloud. Kenny & Alison initially planned on a winter ascent of Curved Ridge but the wet weather saw a change of plans and they headed of booted and suited to Beinn Chaorach. Allan S, Kate and Martin initially planned to head home but a break in the weather tempted them up Beinn a' Chrulaiste where they were rewarded with good views of the surrounding hills. Claire, Iain, Ali, Ian, Rebecca and Carla went up Stob a Choire Odhair and despite finishing in the dark still had a good day.